Chelsea's David Luiz last night demanded an apology from Manchester City's Sergio Aguero after the Argentine escaped punishment for a two-footed stamp in which he ran his studs down the back of the Brazilian's legs. Aguero is highly likely to escape a retrospective red card from the Football Association for the challenge, in which he barged Luiz before jumping into his backside with his studs, because referee Chris Foy spotted an infringement and awarded a free-kick to Chelsea without booking Aguero. Luiz said: "Aguero is a great player and I think he needs to be honest with himself and say, 'I don't like to do bad tackles, I don't like to do that'. I forgive everyone in my life, people are happy when Aguero is scoring goals, doing things in the game. Many people have said to me, 'Sorry this is not me and not good for the football'. Many kids see the game, watch the game and want to see good things and not bad things." The 25-year-old said he would have apologised, had he delivered such a tackle. "Of course, I would apologise to everyone," Luiz said. "I want just to show people good things. Both teams tried to win, both created opportunities and tried good things, Sometimes in the games people have five seconds, be angry and do things you don't like to do. I think that. Benítez said: "Yeah, but I think it's not my job now. Still, the penalty not given is more important." "I never saw Aguero do bad tackles on other players. I think it was five seconds [of anger] and I forgive him. I didn't speak to him after the game. I have a good heart, I don't like to beat [up] some people." The Chelsea interim manager, Rafael Benitez, said he was "disappointed" after his side's 2-1 defeat – which guarantees Wigan Athletic will be in next season's Europa League – and that the issue of challenges such as Aguero's was "something they have to clarify". But he insisted, with some justification, that a tug on Fernando Torres' shirt by Vincent Kompany in the penalty area was a more significant oversight by Foy. "At that time it offered us a chance [to equalise] and it could have been a red or a yellow card," Benitez said. "Still the penalty not given is more important. I've seen the pictures and Torres has his shirt [pulled] up. I don't want to argue with Roberto [Mancini]. They are a very good team, could have scored another in the first half maybe. You have to give credit to them, but the penalty not given is very clear." City's win makes them 1-5 favourites for the FA Cup final with Wigan on 11 May, which is expected to have a kick-off time of around 5pm, despite the problems encountered by Wigan fans, for whom Saturday's 5pm kick-off left them with no trains home. For Mancini, victory over Roberto Martinez's side would deliver a third trophy in as many seasons for City, after 35 barren years, though he refused to discuss that prospect last night. 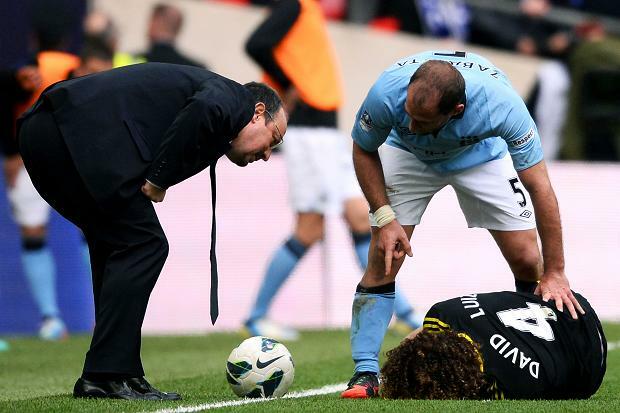 Mancini said he had not seen the Aguero challenge on Luiz. "I need glasses! I didn't see," he said. "If I'd seen it, I'd say. But Sergio did take a lot of challenges. The referee was there... if Sergio did something wrong. I remember, because it was in front of our bench, David Luiz did a tackle against him, but I didn't see what happened [next]." Mancini claimed that Oscar's second-half challenge on Yaya Touré should also have been a penalty. The City manager's relationship with goalkeeper Joe Hart, who has not played an FA Cup tie since the 2011 final against Stoke City, is likely to be severely tested by his disclosure last night that he will play Costel Pantilimon in next month's final. "He did very well, but he's a good keeper and deserves this. We have four weeks to think about this, but I think it will be his [in the final]," Mancini said.